Throwing it back to a Momma & Poppa Powell classic. It is made with cambozola, but if you don’t like blue cheese camembert works just as well! As I say with most of my recipes, it is simple, easy and delicious (seriously, that should be my tag line) – which is just the way I like my food. What makes this recipe even better is that it can be done in a rush. All these parts can be done separately and assembled (and warmed) when you arrive at your destination. So who wants a party (so we can eat these tasty treats!)? *If you don’t like blue cheese, replace with Camembert. **To make this easier to slice, put in the freezer for a half hour and cut with a knife that has been run under hot water. Be sure to clean the knife in between every few slices with the hot water to prevent the cheese sticking. Season the tomatoes with salt to taste in a large bowl. Set aside. Meanwhile, slice the wheel (across the whole wheel) of cambozola as thinly as you can. Cut the larger pieces in half. 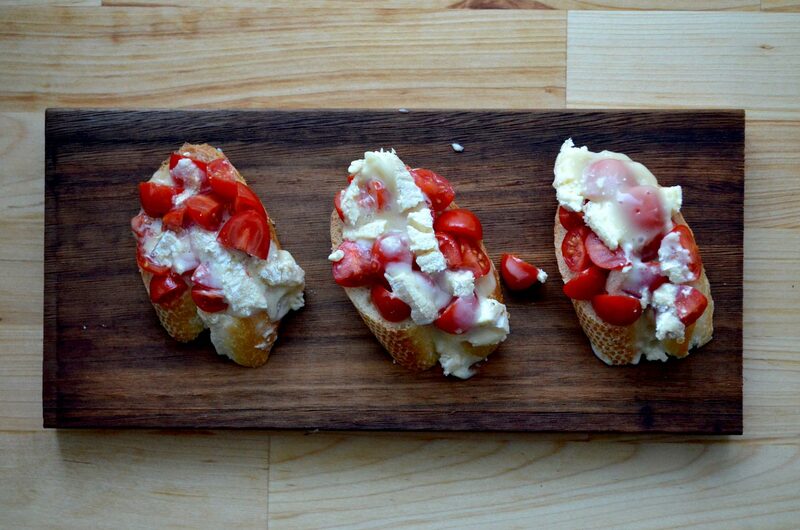 To assemble place about 2 tbs of tomato mixture on each toast and top with a slice of cheese. Broil in the oven until the cheese is melted.